With just eight weeks to go, we have started our countdown. This week we have been checking the equipment and picking up any bits and pieces that were missing or needing replaced. As well as the little things like sunscreen and wet wipes, we have also had to consider things like the larger file sizes of the cameras we shall be using and make sure we have sufficient storage. Next week we visit the doctor to make sure our vaccinations are up to date and to get our anti-malarial medication. The only thing we still need to pick up after that is a Safaricom dongle, so we can update the blog as we go. That will be bought after we arrive in Kenya. As a prelude to what is to come, we thought we would share with you some of the magic moments from our previous visits to the three National Parks we shall be visiting on this safari, Tsavo East, Tsavo West and Masai Mara. Starting today with the first of them, Tsavo East. The signs at the entrance to Tsavo East National Park have some interesting things to say; the main sign refers to the Park as "The Theatre of the Wild" and that is not an exaggeration. 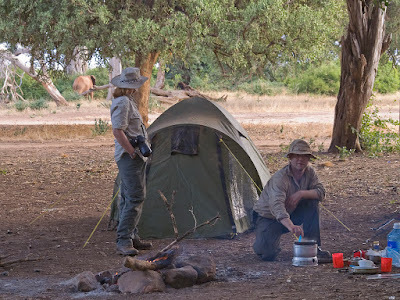 Coming from Scotland, where we have to jump through hoops and go to extraordinary lengths just to see what little remains of our wildlife, I have described Tsavo East to people here as a place where "you are tripping over wildlife". 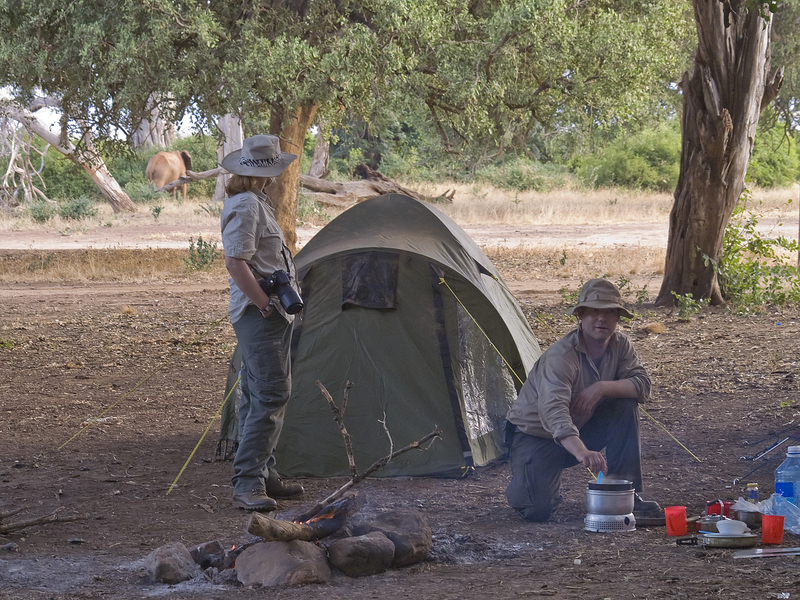 When Jason (pictured above in Tsavo East with Karen) joined us on safari in 2008, one of the first things he said to us was "I see what you mean now about tripping over wildlife!". Another sign says "Speed limit 40Kph but don't worry if you exceed it, the elephants will soon let you know", adding a touch of typical Kenyan humour to a serious warning message. 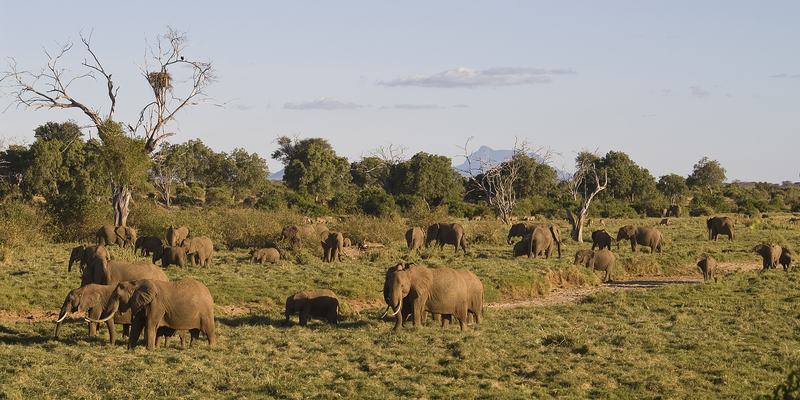 Elephants are a major part of what makes the Tsavo ecosystem so special. There are lots of elephants here - over 12,000 but it wasn't always so. Poaching in the 1970s and 1980s reduced a population of 40,000 to less than 5,000 before the Kenya Wildlife Service came into being and well-trained, well-armed rangers began to take on the poachers. Thanks to the work of the Kenya Wildlife Service and the ultimate sacrifice paid by many of the Rangers, we can again enjoy the spectacle of large gatherings of these highly intelligent and socially aware creatures. 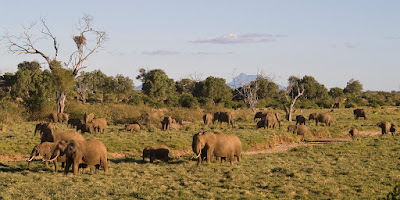 In July 2008, we were priviledged to experience a major elephant gathering in Tsavo East, counting over five hundred in attendance with more still arriving as we left at sundown. As each new family arrived there would be much trumpeting and friends and relatives would rush to greet them, with trunk-wrapping and ear-flapping. Adolescent males were playing push-me-shove-me, in preparation for the time they would battle in earnest for the right to mate in later years. To witness such an event, especially in an era when elephants are extinct in many African countries, was a true priviledge! Unfortunately I only had a 70-300mm lens on the camera at the time, so could not zoom out enough to catch the full glory of the gathering but the photo below shows a small portion of the elephants there. More about the elephants later but in our next post, we will talk about another creature for which Tsavo is famous, or rather infamous, the lion! In the meantime, please consider making a donation to our chosen charity Save The Elephants to help with their ground-breaking work in understanding elephant society and helping to prevent human/elephant conflict in ways which benefit rather than penalise the local population.